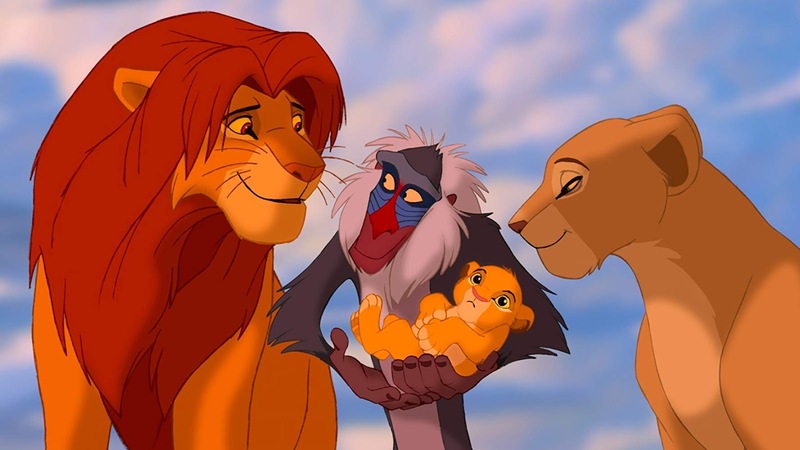 Thanks to my nephews (now in their 20s) and my children (now teens and tweens), I have seen the 1994 film The Lion King hundreds of times. There is no way to gauge a true number of viewings, but the film remained so popular within our family that it was one film we could all agree upon on a family movie night. 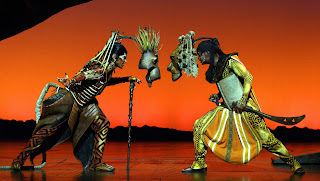 Once The Lion King came to Broadway, it was something we always expected to see since we live a short train ride away from the Minskoff Theatre, but alas, we never got around to seeing it. On our recent trip to London we came upon tickets unexpectedly, and thus we were going to finally see the show based upon the movie. We watched the trailer before going to the beautiful Lyceum Theatre in the Covent Garden area of London. As we sat waiting in our seats for the show to start, the sounds of the jungle played over the audio system, heightening our excitement. What we witnessed from beginning to end was a gorgeous, vibrant, and magnificent reimagining of the beloved film. Director Julie Taymor (also responsible for Costume Design, Mask/Puppet Co-Design, and writing additional lyrics) shows an obvious love and respect for the film by not only embracing it completely but by also enhancing the power of the story and impact on the audience. The play follows the plot of the film quite faithfully. Since I could probably do all the dialogue of all the characters, I found myself waiting for the delivery of my favorite lines and then being overwhelmed with delight as they were spoken or sung perfectly. There are a few additional songs, including an insightful one from Mufasa (Shaun Escoffery) that basically functions as a soliloquy. These new numbers fit rather seamlessly into the overall production. 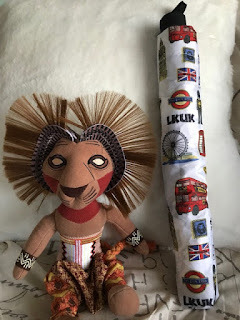 Basically, The Lion King is a loose adaptation of Hamlet, with Mufasa the king who is murdered by his brother Scar (played with delicious glee by George Asprey), thus putting his son Simba (Nicholas Afoa) into the position to avenge his father’s death just as Hamlet must do. Instead of Hamlet’s procrastination and psychological games, we get Simba becoming a mature lion under the care of Timon, a meerkat, and Pumbaa, a warthog (the fantastic Damian Baldet and Keith Bookman). They function as much as Rosencrantz and Guildenstern do in Shakespeare’s play, connecting Simba’s childhood to when he becomes an adult, but fortunately they survive. 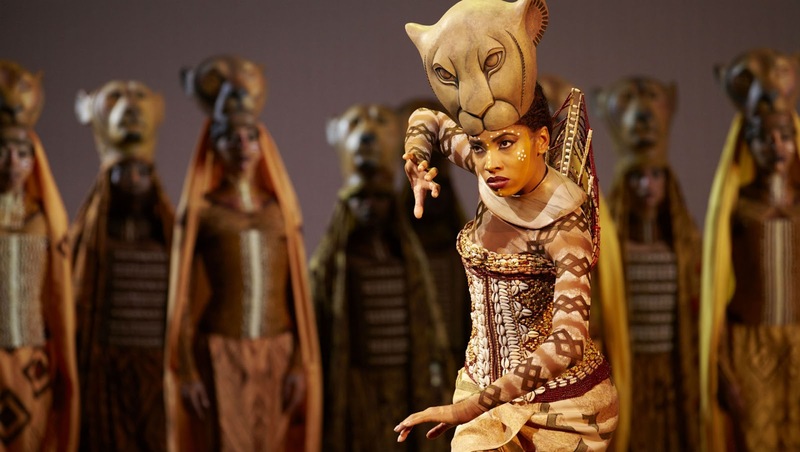 The rest of the cast excels, with Ava Brennan standing out as Nala, the female lion who will win adult Simba’s heart and inspire him to return to take his rightful place as king of the Pride Lands. 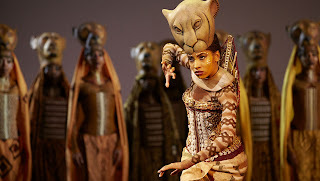 An inspired choice is the casting of Brown Lindiwe Mkhize as Rafiki, the role played so memorably by the late Robert Guillaume in the film, but she takes on the role and makes it her own, earning some of the heartiest applause during the curtain call. As always, the music and lyrics by Elton John and Tim Rice are astounding – I sat there thinking about how well these songs have aged over the last 25 years. 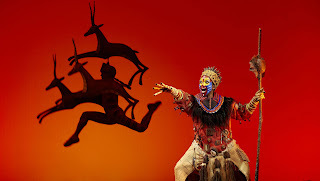 Set designer Richard Hudson has managed to incorporate scenes from the Serengeti in such a way that makes sense visually and compliments the scenes from the film with its own exquisite beauty, and choreographer Garth Fagan has brought the characters to life in delightful ways that mimic animal movements and yet give some human characteristics to them as well. One could not see this play without mentioning the costumes, designed by director Julie Taymor. The imaginative renderings of the animals are amazingly and inventively realized and, as gazelles, antelopes, elephants, and many other creatures prance and pound along the stage, the only reaction is to be in awe as to how it extraordinarily it has been accomplished. During intermission (or the British interval) we refreshed ourselves and got souvenirs as the true tourists that we were. The runtime of the show is two hours, but it went so swiftly. Afterwards, as we left the theatre, I felt uplifted by having seen such an amazing realization of a beloved film that has entertained our family for a quarter of a century. I was uncertain how they would be able to capture the essence of the film, but there is no question that that cast and crew have done great justice to the source material. If you are in London and have time to see a play or two, I strongly recommend The Lion King, especially if you have children. However, it is not just for them because we adults in the audience were just as overjoyed as the kiddies. Go see this play and I guarantee you will come out roaring with joy!